The DST-64T's Drive-Check technology dramatically improves rotational measuring typically used to diagnose and repair ride disturbance complications. The highly precise DST-64T performs a computer-generated driving simulation, then checks and measures the tire/wheel assembly for imbalance and possible run-out of the rim and tire. With the DST-64T, virtually all possible complaints due to rotational imbalance are eliminated before the wheel is mounted on the vehicle. Digital Sensor Technology features 64-bit architecture and single‐chip technology for unprecedented speed and accuracy, especially when using sophisticated balance and weight placement techniques required for newer high-tech OEM and aftermarket wheels. Single-chip 64-bit architecture provides improved stability and accuracy along with greater application speed and data processing while using less hardware. By reducing hardware, service and maintenance costs, equipment life cycle is greatly increased. An extremely fast and dedicated hyper-transport protocol allows data to communicate with the micro-processor at much faster speeds, resulting in lower power consumption, reduced heat and increased stability and accuracy. The DST-64T uses highly precise dual-component piezoelectric quartz load sensors combined with a single digital rotation encoder that measures longitudinal, transversal and shear effects for multi-directional force unbalance detection. The piezoelectric force sensors used on the DST-64T are very sensitive and offer long-term stability and freedom from fatigue for a service life that is virtually unlimited. The high rigidity quartz crystal sensors result in very high frequency detection in all three directions of measurement. Our revolutionary DataWand™ and inner data set arm allows you to quickly and automatically enter all wheel parameter settings in less than three seconds—wheel diameter, wheel width, offset distance and targeted weight placement positioning for exact balancing every time. The parameter values are automatically entered into the wheel balancer by a single, simultaneous maneuver of the extendible and storable DataWand, as well as the inner data set arm. This reduces setup times and eliminates opportunities for human error. The DataWand also features a built-in tape weight holder that facilitates tape weight placement and positioning at precise locations. A soft-touch key pad and display panel feature tire and wheel graphics to make entry of wheel data easy and extremely fast. The interface guides operators through each balancing procedure in a step-by-step format. Function keys are labeled with simple, easy-to-read icons that make it easy to identify each balancing function. Bright LED weight placement indicators and an audible alarm identify exact weight positions as the wheel is gently rolled to exact top-dead-center. Tiered weight placement indicators help identify out-of-sight weight placements such as split-weight or hidden “behind-the-spoke” techniques. The DST-64T incorporates a brightly displayed light-emitting diode (LED) inner wheel target light, which automatically illuminates the interior of the rim and helps identify the exact weight placement location. Auto-activates each time the wheel restraint pedal is depressed. In order to minimize sunlight glare and increase user productivity, the DST-64T features a multi-directional control panel and anti-glare surface that improves touch screen readability. Easy horizontal and vertical adjustment of the control panel minimizes glare and reflections from overhead lights, windows and other light sources. In addition to multi-angle positioning, the DST-64T control panel features a screen surface that causes light to diffuse and reflect for better visibility. Multi-size center cones, rear-mounting spring and full rubber, perimeter no-mar “Quick-Nut” bell adapter all make mounting wheels fast and easy and minimize the risk of costly wheel damage. The DST-64T automatically calculates the weight required to balance the tire on the wheel, which means you don’t use as much weight as you have in the past. More accurate placement and testing saves you time and money, as well as the cost of wheel weights, which adds up over time when you waste steel. Newly designed side shelf features an open-top design that accommodates Ranger Quick-Peel™ adhesive tape weight, which comes in convenient bulk rolls. The DST64T tooling package not only includes our standard car and light truck cones, but a medium-duty truck cone, as well. This well-equipped four-piece cone set includes the following sizes: 1.75”-2.75”, 2.75”-3.50”, 3.50”-4.25” and 4.25” - 5.12”. Other standard accessories include wheel caliper, weight hammer, rear mounting spring, Quick-Nut, Quick-Nut bell adapter and specialty calibration weight. Free samples of Ranger steel wheel weights will be included with your purchase of a DST2420 and/or DST64 Series wheel balancer. Starter Kit includes one bulk roll of 100 silver adhesive steel tape weights, one bulk roll of 100 black adhesive steel tape weights and one starter box of mixed clip-on steel weights. If you like the product we offer, you are welcome to order more wheel weights from us at any time. Essential for more precise balancing, this adjustable multi-position flange plate kit includes centering pin adapters to fit most imported cars, domestic cars and light truck lug-bolt patterns. The specially designed lug-bolt adapters balance wheels far more accurately than a cone can do by itself, resulting in a smooth, vibration-free drive. Includes flange plate kit and measuring caliper. 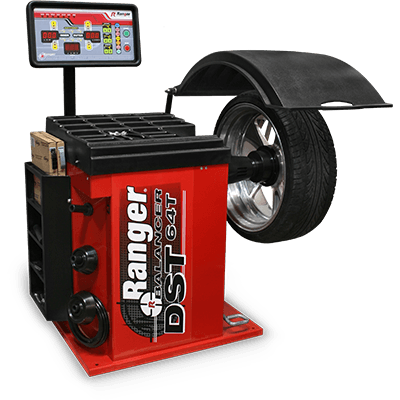 Wheel Weight Starter Kit – Free samples of Ranger steel wheel weights are included. Starter Kit includes one bulk roll of 100 silver adhesive steel tape weights, one bulk roll of 100 black adhesive steel tape weights and one starter box of mixed clip-on steel weights.